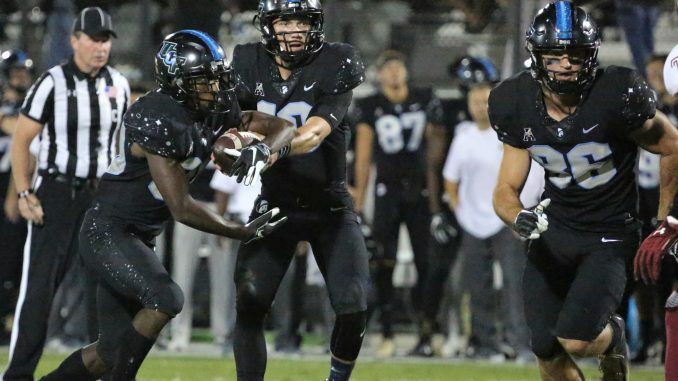 For UCF and Temple, a lot was on the line when the teams met at Spectrum Stadium on Thursday night. With both teams tied for first place in the AAC East, the winner would control their own destiny in the hunt for a conference championship appearance. After a prolonged shootout, the Knights (8-0, 5-0 AAC) came out on top, defeating the Owls (5-4, 4-1 AAC) 52-40. It was UCF’s 21st win in a row. It was a rare close game for UCF, which has been blowing out teams for most of the season. From the start of the game, UCF’s defense simply looked outmatched. The Owls ran all over the Knights, adding up points throughout the half. Temple scored on five of its first six drives, as the UCF defense simply looked confused at times. Slowing Temple down finally gave UCF’s offense a chance to grab a lead it could hold onto. And this isn’t the first game where we’ve seen something like this. Earlier in the season, Memphis dropped 30 on UCF in the first half before being held scoreless in the second. Overall this season, the Knights are allowing an average of 13.9 points in the first half, compared to an average of just 7 points in the second half. What went right: The offense. In Milton’s first game back, he wasted no time reminding the college football world that he is one of the best quarterbacks in the nation. Despite throwing an interception, he passed for 312 yards and three touchdowns and also picked up another score on the ground. But Milton wasn’t the only player to put up impressive numbers. The whole offense seemed dominant throughout the night, in large part thanks to a strong effort from running back Greg McCrae. The Knights finished with 52 points, which is the third highest scoring game for UCF this season. What went wrong: The first half defense. Despite an impressive second half, UCF has to figure out how to be more effective defensively early on. This is the second time in three games that the Knights found themselves down at halftime due to a poor defensive performance. The final three games of the schedule are not going to be a cake walk. The combined record of UCF’s final three opponents is 16-9, and two of those teams are averaging over 30 points a game. The Knights aren’t going to be able to climb out of every hole if they’re almost buried at halftime game after game. Offensive Player of the game: Greg McCrae. The former walk-on had a huge impact for UCF, especially in the second half when his ability to pick up first downs helped put the game away. He finished the night with 188 yards and a touchdown on just 16 attempts. Temple simply didn’t have an answer for him. McCrae is now averaging 9.7 yards per carry on the season. It won’t be surprising to see him continue to be a huge part of the running game in the closing stretch of the season. Defensive player of the game: Richie Grant. The redshirt sophomore defensive back had another impressive game for the Knights. He finished with seven tackles on top of a late interception that sealed the win for UCF. He’s been one of the most consistent players on defense all year for the Knights, even when the team has struggled early in games.